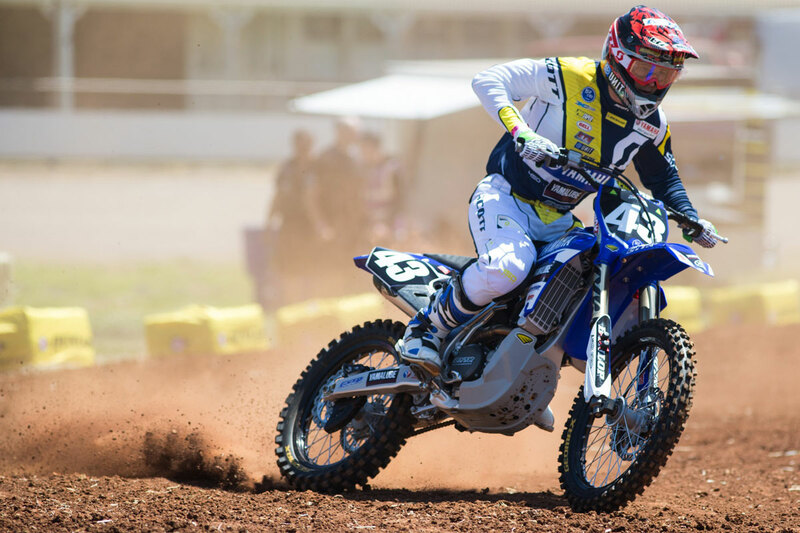 Yamalube Yamaha Racings’ Jordan Hill continued his solid start to the 2016 Australian Supercross Championship with another top 10 performance in the SX2 division at round two of the championship held at Toowoomba on the weekend. Hill started off struggling to come to terms with the difficult track and couldn’t manage a fast line through some of the long combination jump sections. He was losing considerable time on those sections of the track and qualified in 16th place and left with plenty of work to do. But he went to the start line determined to turn his day around and pulled a great start to lead the field on the opening lap of his heat race. He dropped slowly back to fifth place but still a comfortable position to qualify for the 15 lap main event. When the gates dropped in the main, Hill was left floundering on the start as he was tangled in several bikes as they jostled for position going into the first turn. He managed to keep it up right and settled into a good pace on the opening laps. He chipped away at the riders in front of him and moved into ninth place with a handful of laps remaining. A position where he would stay until the end of the race. His two top 10 results at the opening two round have left him in seventh place for the championship and looking forward to the rest of the series. “I’m a little disappointed with my riding on the weekend,” Hill commented. “I didn’t attack some of the sections of the track like I should have and it could have made a massive difference to my result. “I improved my lap times by around three seconds from qualifying to the final so that’s a positive and my corner speed was good, but I just have to find a way to jump through the combination sections quicker and I’m sure I can finish inside the top five,” Hill ends. The night was over before it started for team mate, Mitch Evans. During the opening practice section, Evans miscued a tricky section and landed short causing a heavy impact on his hands and wrist. He immediately pulled to the side of the track and sort medical attention. It was later confirmed that he had indeed cracked his radius and will be sidelined for the rest of the series. It was a bitter blow for Evans and the team. “Since I have returned from Europe, I have been working hard at home preparing for Supercross so I’m so disappointed this happened. I was trying to jump from the Dragons back to the table top after it when the front wheel dropped and plowed into the up face of the next jump. I didn’t even crash but I knew I had damaged my wrist. “That’s game over for me this year but I will be back next year. Thank you to the Yamalube Yamaha Racing team for their support this season, they are an awesome team and have played a huge part in my results this year,” Evans said. At this stage, the team are unsure if they will enlist another rider to finish out the championship. To follow the Yamalube Yamaha Racing Team on social media; www.facebook.com/YamalubeYamahaRacing or @yamalube_yamaha_racing on Instagram.